We are committed to providing well-rounded, high-quality training for dog owners. A well-trained dog is able to communicate and function in your home and around others. At Dogs By Andy, we believe training is about function, control and prevention. 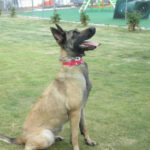 At Dogs By Andy K-9 Services, our training guarantee is that you will be 100% satisfied with your dog’s behavior. All of our training is covered for the life of your dog, and should the dog regress, we will conduct remedial training in our kennel at no cost to you. Dogs By Andy K-9 Services guarantees that all dogs will be trained in a professional manner by full-time dog trainers. We teach basic commands that are necessary functions for your dog’s safety and the well-being of people and other animals. Commands are important at all times for a variety of reasons, and if your dog is well-trained, you have the control, and that is important if you are a responsible dog owner. The price for our courses includes lifetime membership to the Dogs by Andy Family. This membership is for the life of your dog and provides remedial training in our kennels should your dog regress. 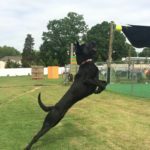 Family membership also includes annual events with other Dogs By Andy Family members, as well as receiving a discount on boarding in our kennels. At Dogs By Andy K-9 Services, we are committed to providing well-rounded, high-quality training for dog owners in Greensboro, North Carolina. Please give us a call if you are interested in learning more about our training options and when you can begin our next course. We look forward to welcoming you to the family! Our dog training facility in Greensboro is just what you need for an improved relationship with your dog. It is challenging to have the time and expertise needed to provide effective dog training to make sure your family canine behaves in an appropriate manner. Choose one or both of our leash training courses at our Greensboro facility for a well-mannered dog you will be proud of. It can be tempting to forego leash training after a few attempts have failed and you feel like your arm has been ripped from its socket. We provide an assessment of your dog for protection training in Greensboro to determine if they will be well-suited. Do you have a dog that is the right breed and temperament for protection training? Our number one goal is to help both canine and handler gain confidence during search & detection training in Greensboro. When you see a dog with their nose to the ground, they are using their natural instincts to identify the things around them. At Dogs By Andy K-9 Services, we provide dog training for residents of Greensboro, Charlotte, Concord, Huntersville, Cornelius, Gastonia, and the Mooresville, North Carolina area, including Myers Park, Weddington, Ballantyne, and SouthPark. Six weeks of private 45 minute-1 hour weekly lessons with a trainer, you, and your dog. Ten weeks of private 45 minute-1 hour weekly lessons with a trainer, you, and your dog. Our popular “Board and Train” program. Three-weeks of in-kennel training for your dog. Customizable training for protection of you and your family. Narcotics, explosive, contraband or bed bug detection training. Executive Protection Dogs from Paladin K-9, our sister company. We teach basic commands that are necessary functions for your dog’s safety and the well-being of people and other animals. Commands are important at all times for a variety of reasons. If your dog is well trained, you have the control and that is important if you are a responsible dog owner. A well trained dog is also able to communicate and function in your home and around others. Training is about function, control and prevention. Consider the following: A well-trained dog always responds to a command — not just some of the time or part of the time. Why is this important? A dog cannot SIT and jump on a person at the same time. A dog cannot SIT and STAY and run out the door into traffic at the same time. A dog that obeys the HEEL command will not pull you down the street. A dog that responds to DOWN and STAY can enjoy being in the room with you without interfering with your mealtime or guests. A dog that COMES WHEN CALLED is not going to have to be chased. Environmental Issues such as Barking, Unwanted Jumping, and Climbing on Furniture are also taught during our training. Verbal and physical abuse can never be a part of the relationship between you and your dog. Abuse destroys love and trust in dogs as well as people. How is a dog going to learn if he is afraid of your hands, your feet or your voice? Why should a dog “Come” to you if he is frightened? Yes, yelling will scare him. Your dog’s hearing is five-times better than yours. If you are yelling at him and he cowers, it’s not guilt. He is afraid of the sound. Place – The “Place” command teaches your dog to go to and stay at a pre-determined “place” within the house. This command is very useful when entertaining or when delivery people are at your door.